Casa Rural with 6 rooms, although it is closer to the idea of Rural Hotel. It has a very friendly atmosphere and great attention to detail, all in a quiet and relaxing environment. We provide varied buffet style breakfast, with quality local products. Available rooms include 4 doubles with double bed, 1 double with two beds and 1 room with a double bed and a living room with sofa bad. The five rooms on the first floor have a sloping roof with exposed wooden beams. Includes daily cleaning of rooms, maintaining the highest levels of hygiene. 3 rooms approximately 15 m2 with double bed of 150cm x 190 cm. 2 on first floor 1 on main floor. 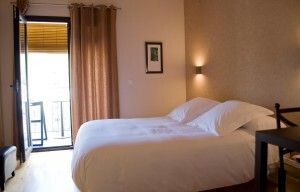 1 room approximately 17m2 with twin beds of 90 cm x 190 cm. Main floor. All rooms have wooden floors and a desk. – Bathroom complete with separate toilet, shower cabin and sink. The House has 2 double rooms with balcony. 2 rooms approximately 15m2 with double bed of 150 cm x 190 cm. Both rooms on first floor. Both the rooms have sloping wooden ceiling with exposed beams, wooden floor, writing desk, table and chairs. Balconies overlook the Hoces del Turia. The House has 1 suite. 1 bedroom approximately 15 m2 with double bed of 150 cm x 190 cm. On first floor. 1 Living room with adjoining hall approximately 10 m2 with sofa bed 120 cm x 190 cm, table and chest of drawers. 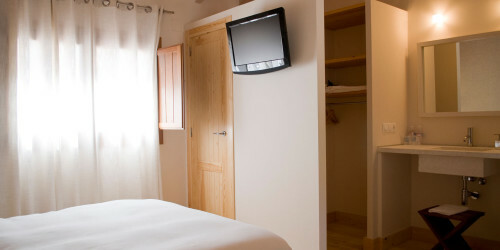 The suite has a sloping wooden ceiling with exposed beams and wooden flooring.